Description: Westbound BNSF Intermodal Train roars thru Woodward. Description: BNSF 105 and BNSF 4754 power the Clovis, NM to Atlanta, GA run thru stack train thru the east end of KCS High Oak Yard. Description: Next to the heavy horse power GE's, these guys look pretty small. On a mixed train at Cermak & Canal in Chicago. Description: THESE TWO CREWMEN ARE WASTING NO TIME HERE. THIS TRAIN BACKED INTO ORANGE FROM THE NORTH THEN PROCEEDED TOWARDS ANAHEIM. GOOD POWER SHOW AND VERY POLITE CREWMEN, THEY DIDNT SEEM AT ALL SURPRISED TO SEE A FOAMER AT FIVE IN THE MORNING! Description: THIS TRAIN BACKED INTO ORANGE FROM THE NORTH THEN PROCEEDED TOWARDS ANAHEIM. GOOD POWER SHOW AND VERY POLITE CREWMEN, THEY DIDNT SEEM AT ALL SURPRISED TO SEE A FOAMER AT FIVE IN THE MORNING! Description: The Sand Jack local with three GP60Ms. 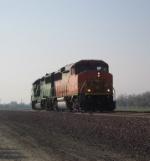 Description: BNSF 105. Working the National City local.